A serious competitive option in high-gain rock and metal tones, with cleans if you need them. Simple layout. Choice of metal tones. Lacks versatility. Clean tones could be better. With players such as Soulfly's Max Cavalera ensconced in ads for this new head, you can bet a decent jazz tone isn't top of the agenda here. It's hardly Peavey's first attempt at a 120-watt three-channel head either. But where the 6505, for example, squeezes additional gain (courtesy of a switchable crunch option) into a pair of channels, the 3120 follows the JSX series by providing three independent channels across a feature-packed yet logically laid-out front panel. Each channel possesses separate bass, middle, treble and volume controls, with the dirtier rhythm and lead channels additionally loaded with their own gain controls. There's no reverb, which isn't much of a concern considering the target audience, while the overall output is controlled by a master volume. If you're too impatient in your pursuit of rock to connect the included three-way footswitch, you can flick between channels via the front-loaded three-way toggle. The remote three-way, as well as giving access to the channels, also allows you to switch the mono effects loop in and out - the rear-placed send and return jacks have their own level controls, potentially a very useful feature indeed. Also on the rear panel, and keeping traditional features such as the speaker outs and associated impedance selector company, is a three-way slider switch. This enables you to alter the way in which the amp interacts with the speakers themselves. Called 'damping' by Peavey, this is a more intuitive evaluation of the resonance and presence control combination of the 6505 range. Though the results are simpler to notice when hearing the amp, the three settings - tight, medium and loose - denote varying degrees of speaker coil control. There's a line output with level control too. 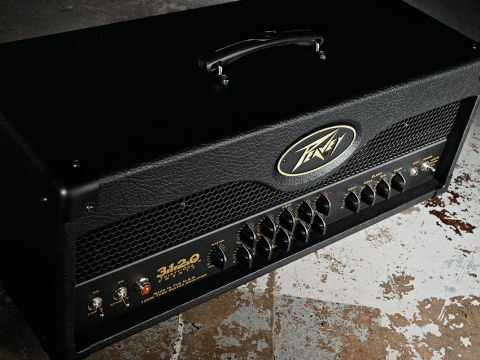 This is a head that's focused solely on the matter at hand - providing top quality metal tones. No-frills can sometimes be assumed - wrongly in this case - to be a derogatory phrase, but it describes the 3120 to a tee - the lack of push/pull notches, gain filters, tea-makers and so on makes a refreshing change; they often get in the way of the actual playing. These days it seems that the division of channels into rhythm and lead is becoming unnecessary. Clean channels have obvious voicings, but the level of gain provided by the other two is very similar. You could easily play lead through the rhythm channel and vice versa, and be adequately served. We mirrored the settings of both dirty channels with gain and volume set to seven. The lead channel is brighter and more aggressive due to the to extra juice from the preamp. The only real issue, and we feel that this is also true with the 6505 to a similar extent, is that there's too big a jump in the level of drive between the clean channel flat out and the rhythm channel with low gain settings. In fact, even setting the rhythm channel's gain to just over one gives a full fat rock drive that's less AC/DC and more Thin Lizzy; any higher and you're into Iron Maiden territory, albeit with a heightened trebly rasp. All well and good, of course, but be aware that you'll need to become adept at regulating volume with your guitar rather than the amp - hardly a straightforward exercise when riffing hard. For a very cool metal tone, we find that setting the lead channel with a tight damping ensures that staccato riffs are suitably percussive. As their names suggest, the medium and loose damping settings relax the resonance of the overall tone - for example using a looser damping at lower volumes can help thicken out your sound. It's worth noting that the volume does vary significantly between the three settings, so do be aware of that. We reached for our Schecter Blackjack to take advantage of that guitar's active pickups, and the additional edge provided certainly ups the ante as far as sheer aggression goes. Setting the rhythm channel's gain to around eight and using just medium damping, tuning down a full step to D really gives a dark wall of sound that can be counteracted for solos by flicking to the lead channel. For clean tones the 120-watt rating leaves ample headroom, but you might find yourself wishing for a little more character. That said, we're not talking about a vintage-voiced tone box here - we'd wager that most metallers will trade volume for subtlety when it comes to cleans, and the 3120 has plenty of the former. The channel does dirty up with the channel volume wound up, but it's not very inspiring. In fact it brings to mind the Marshall JCM800 2203, an amp almost universally loved for its rock drive, less so for its clean tones. This is an interesting head. For extreme rock, metal and associated styles it provides several tones that, although all dripping in cascading gain, offer plenty of detail and texture when you use different guitars and their controls. We'd suggest utilising the rhythm and lead channels for both chords and single notes irrespective of their specific denomination, as the latter provides more abrasion for cutting riffs, while the former gives plenty of opportunity for smooth, warm solos. The clean tone may be a little flat, but the upside is that with all that headroom it will take pedals and processors very well indeed, which fits with a lot of current playing styles in any case. Moreover, it will allow you to shred, riff and blast to your heart's content. Indeed high-gain rock and metal is where the 3120 is most at home with a selection of sounds that suit those genres well for live use. The price? Compared with the competition, just over £1,100 is fair for an American-built amp, making it a worthy contender.